For many people, this is the middle of the biggest holiday season of the year. Busy schedules get even busier. Some of us add holiday gift shopping, pictures, cards, and parties to an already overloaded calendar. Personally, I’m about ready to tear my hair out! So, what’s the answer? How do we find peace? 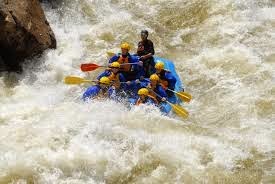 Let’s look at the image above: these outdoor sports enthusiasts on the raft are on Class 4 rapids (the most turbulent) in a river somewhere. They must be uneasy, at the very least. Perhaps, the only thought that keeps them going is the fact that the “storm” is temporary. The rapids cannot completely obliterate their view of the land. They can clearly see the land on at least one side of their raft. How can we Survive the Tempest? Lee Gonzales, another friend, suggests that we give thanks in pain, have an attitude of gratitude, count our blessings, and be grateful in our circumstances. Lee states that we can choose to be grateful no matter what: The famous story of the Mexican fisherman—He was content to live a simple life in a small coastal village. A savvy business man tried to lure the man away from his village. The financial genius tried to entice the fisherman into an ambitious fast-paced, wealthy lifestyle. This lifestyle could take 20-30 years to fulfill, after which the fisherman could retire to a small Mexican village and live a simple life…Hello? May we all find a place of stillness within the maelstrom of the holidays! How have you calmed your storms?